Flight Control Rocket is the next evolution of Firemint's genre-defining #1 hit, Flight Control. Leave the terrestrial skies of Earth and venture into a whole new galaxy of adventure, action, and addictive path-drawing gameplay! If you don't succeed on the first attempt, try again! Flight Control Rocket provides multiple lives every game. You can also use special bots to boost your game and clear difficult stages. 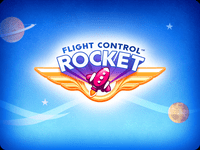 Easy to learn but hard to master, Flight Control Rocket is a galaxy of fun!